Leading Manufacturer of line thrower, tactical resqmax line thrower, resqmax line deployment thrower and pneumatic line thrower from Roorkee. the ResQmax™ line thrower is the essential tool for water rescue. Varied in its applications, the ResQmax™ can deploy a wide variety of lines to distances up to 400 ft / 122 m. Because the ResQmax™ is a non-pyrotechnic line thrower, it does not require special storage, shipping, or licensing. This pneumatic line thrower replaces traditional pyrotechnic line guns with an intrinsically safe option. The system is powered by compressed air and the components can be reused, making line-throwing training an inexpensive operation. The ResQmax™ is a new generation line thrower specifically designed to deploy a line only, or an auto-inflating flotation sling and retrieval line to an otherwise inaccessible point in both land-based and maritime environments, providing an emergency response capability without putting the rescuer at risk. 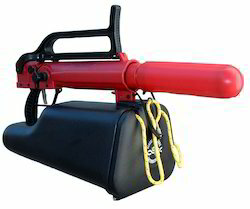 Utilizing a patented air-thrust launcher technology, the ResQmax™ is non-pyrotechnic, reusable, and refillable. Launcher housings are injection-molded from polycarbonate for durability and high impact resistance. Two manual back-up systems on the auto-inflating sling assure fail-safe inflation. 3,000 psi / 207 bar service pressure line projectiles. The ResQmax™ line thrower comes in standard kits and can also be equipped with lines of specific strength and length to target end-user requirements. This line thrower is especially useful for rescues where a heavy line is required or long distances must be breached. Operational lines can be established with ease for a variety of applications including high or low angle rescue, construction projects, and ship-to-ship line deployment. 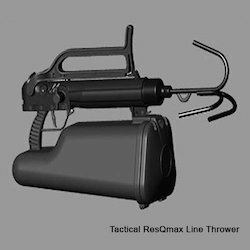 We are one of the leading organizations actively involved in offering a broad gamut of Tactical ResQmax Line Thrower to our respected clients at very reasonable rates. As per the exact specifications of the clients, we are offering them ResQmax Line Thrower and Launcher, which is developed with high-grade components. The ResQmax™ is a new generation line thrower specifically designed to deploy a line only, or an auto-inflating flotation sling and retrieval line to an otherwise inaccessible point in both land-based and maritime environments, providing an emergency response capability without putting the rescuer at risk. 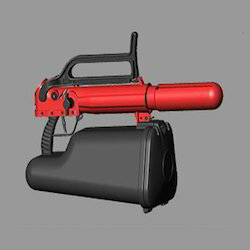 Utilizing a patented air-thrust launcher technology, the ResQmax™ is non-pyrotechnic, reusable, and refillable. Launcher housings are injection-molded from polycarbonate for durability and high impact resistance. Two manual back-up systems on the auto-inflating sling assure fail-safe inflation. 3,000 psi / 207 bar service pressure line projectiles. The ResQmax™ line thrower comes in standard kits and can also be equipped with lines of specific strength and length to target end-user requirements. This line thrower is especially useful for rescues where a heavy line is required or long distances must be breached. Operational lines can be established with ease for a variety of applications including high or low angle rescue, construction projects, and ship-to-ship line deployment. As a line thrower, the ResQmax™ can deliver a variety of line types, depending on the application, over distances up to 400 ft / 120 m. As a water-rescue device, it can deliver an auto-inflating flotation sling and retrieval line to a victim in the water over distances up to 300 ft / 92 m.
Multi-Shot Capacity. The patented nozzle valve permits any number of projectiles to be precharged and stored with the unit, allowing deployment of multiple projectiles in rapid succession. The safety mechanism on the launcher is "always on," resetting automatically when a projectile is inserted.The projectile's "Push-Click" engagement allows easy reloading, even in the dark.A pressure relief burst disk prevents unsafe pressure build-up that could result from exposure to extreme heat.